Sat 13 July 2019, 6 p.m.
Rossini in Erl … Erl – the Pesaro north of the Brenner … The works of Rossini were fostered with much love and commitment over the past four years at the Tyrol Festival Erl. Guillaume Tell will be revived in the coming summer season and again arouse discussion. This time in the original French version and some of the main roles have been re-cast. In 2016 Tell marked the beginning of the exciting preoccupation with Rossini, who has repeatedly revealed that without works such as Guillaume Tell, the operas of Bellini, Donizetti, Verdi and ultimately Wagner too would have been unthinkable. An aria for solo cello and baritone – who invented it? Rossini of course … However, what is so magnificent about this ‘Grand Opera’ is that its ingeniousness is revealed not only to listeners with an affinity to musicology, but powerfully presents an impressive and rousing opera evening based on Schiller’s drama William Tell. Michael Güttler from Germany, who has been successful at the Marijnsky Theatre in St. Petersburg as well as at the Vienna State Opera, conducts the score mostly without cuts – even Jemmy’s aria will be heard. 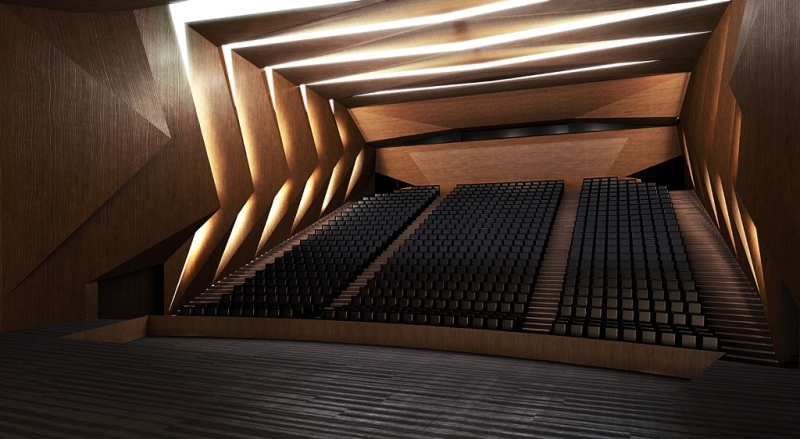 Designed by Delugan Meissl Associated Architects, Vienna, the extraordinary structure boasts 862 seats (130 of which are flexible seats near the orchestra) and the world’s largest orchestra pit (160-sq meters). The total useable surface is 7,000-square meter. General contractor was STRABAG, project manager Ing. Georg Höger. The new Festspielhaus respects and compliments the architecture of the old Passionsspielhaus and its natural surroundings in a unique way: in the summer, when the Tyrolean Festival Erl or the Passion Plays take place at the white Passionsspielhaus, the dark Festspielhaus will blend with the dark forest, allowing the Passionsspielhaus to be dominant. In the winter it is the other way round: while the white Passionsspielhaus will fade into the surroundings, the dark Festspielhaus will stand out against the white landscape. 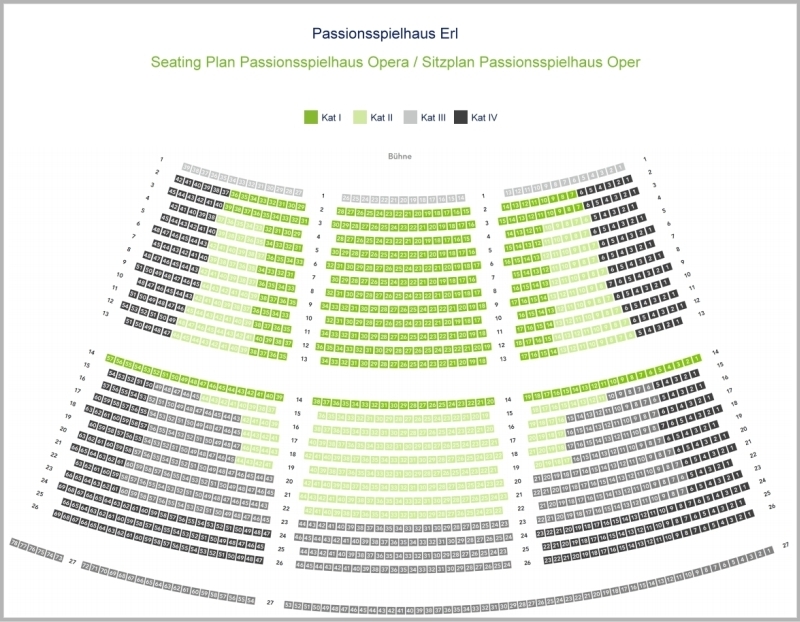 The Festspielhaus offers the modern infrastructure that has been sorely missing at the Passionsspielhaus, including a foyer with cloakroom, modern stage machinery, several rehearsal rooms and plenty of space for administrative offices. 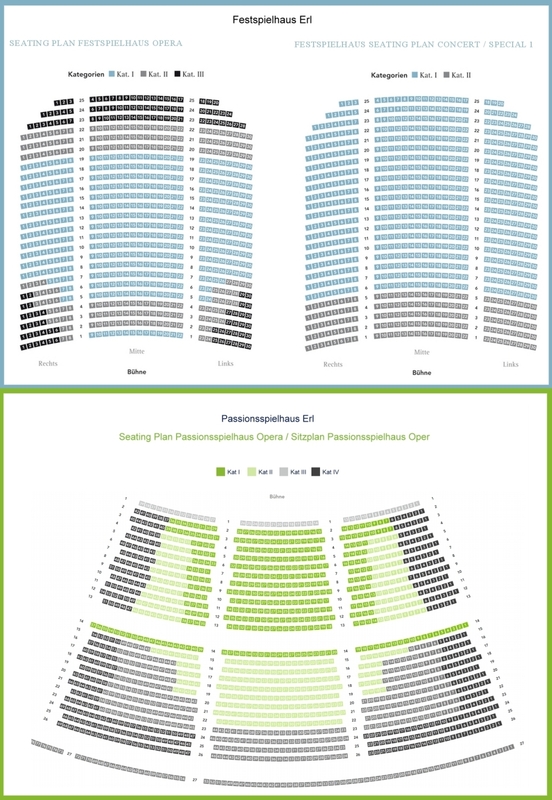 The Festspielhaus provides the Tyrolean Festival Erl with the basic conditions it needs to ensure the Festival’s success will continue into the future. The Passionsspielhaus in Erl, built between 1957 and 159 on plans by architect Robert Schuller, is an architectural and acoustic masterpiece. The structure blends with its surroundings and is a visual extension of the adjoining mountains. 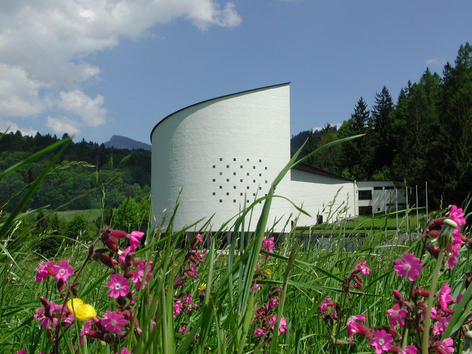 Thanks to its striking shape the Passionspielhaus instantly became Erl’s greatest landmark. 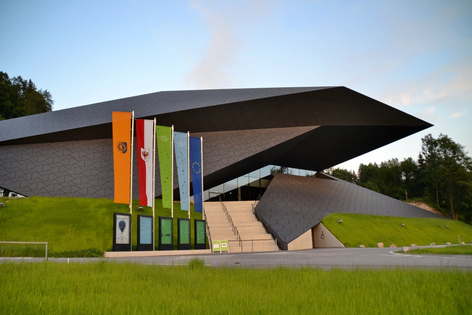 Austria’s largest orchestra theater accommodates up to 1500 visitors. 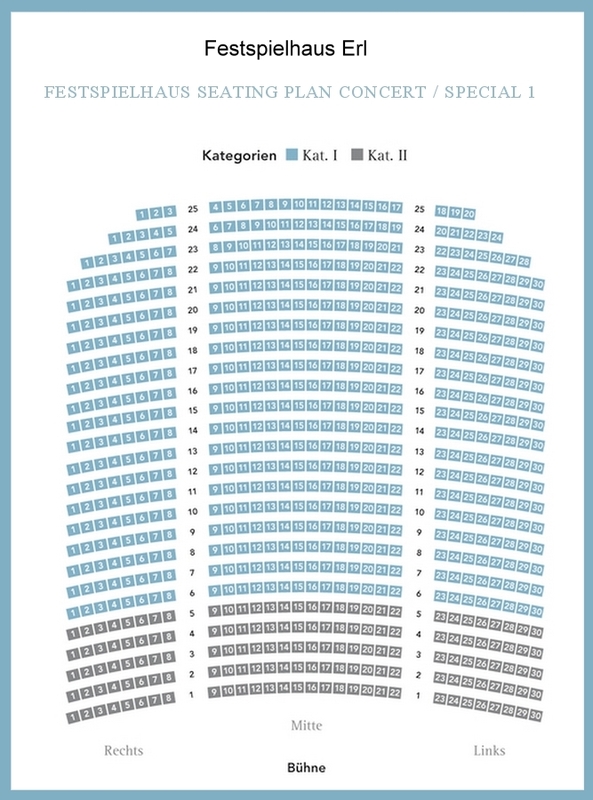 The 25-meter wide stage is tiered and provides a spectacular backdrop for the 500 passion play actors as well as the orchestra of the Tyrolean Festival Erl, which performs onstage as there is no orchestra pit. A café serving snacks and beverages was added in 1997 and an Art Room for 150 visitors was opened in 2003. 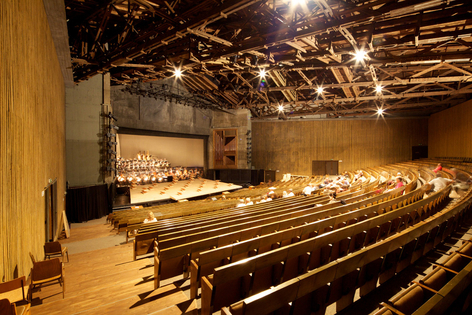 When the Festspielhaus was renovated between October 2006 and April 2007 all sanitary facilities were upgraded; an “orchestra pit” with scissor lift and a substructure for the main stage were added; the auditorium got equipped with a deaf loop system and a new floor; the catwalk, the exterior design, the cellar beneath the donkey ramp, the refreshment stand, all electrical installations and the ventilation system were replaced; and the wardrobe and the stairway renovated. Inntalautobahn A 12, motorway exit Kufstein Nord or Oberaudorf/Niederndorf; from Italy: after Brenner Pass take A 13 and A 12 (approx. 1 h 20 min to Erl); from the Swiss border it’s a 3 hour drive to Erl; the entire journey is on motorways and expressways. In Austria, the use of motorways and expressways is subject to payment of a toll. All long distance and regional trains stop in Kufstein.